PSALMS 62:5 KJV "My soul, wait thou only upon God; for my expectation [is] from him." 2He only is my rock and my salvation; he is my defence; I shall not be greatly moved. 3How long will ye imagine mischief against a man? ye shall be slain all of you: as a bowing wall shall ye be, and as a tottering fence. 4They only consult to cast him down from his excellency: they delight in lies: they bless with their mouth, but they curse inwardly. Selah. 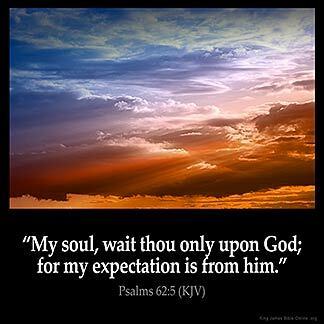 5My soul, wait thou only upon God; for my expectation is from him. 6He only is my rock and my salvation: he is my defence; I shall not be moved. 7In God is my salvation and my glory: the rock of my strength, and my refuge, is in God. 8Trust in him at all times; ye people, pour out your heart before him: God is a refuge for us. Selah. My soule, wait thou onely vpon God: for my expectation is from him. My soul, put all your faith in God; for from him comes my hope. Upon God alone, O my soul, rest peacefully; for my expectation is from him. (62:6) Only for God wait thou in stillness, my soul; for from Him cometh my hope. Yea, He is the supreme. He is the true God and He lives in Heaven. As we wait upon Him Our Faith shall never perish. We will rise at all times! psalms 121.where does my help comes from?my help comes from the Lord. People of GOD be not deserved for every goodthings are from heaven above through our LORD JESUS.